Under the first category mentioned above programmes like Surya Week, Museum Week and Heritage Week are organized. Under the second category theme based activities/workshops, such as Workshop on Miniature Painting, Conservation & Preservation, ‘Moulding & Casting’ etc. are conducted. Under the Curriculum based activities, programmes like ‘Let’s Know our Civilization’, ‘Let’s Travel through past etc. are conducted’. To provide children an extensive information about the ultimate source of Heat & Energy i.e. Sun and all aspects related to it. To provide participants an opportunity to understand various phenomena related to the Sun through activities/practical experiences etc. To not only make children aware of various non-conventional resources of energy but also to provide them an opportunity to make use of the same themselves. This week long programme starts with a Pre-Test followed by an orientation and a visit to the exhibition “Surya”. During this programme children are exposed to various aspects related to the Sun in detail through various activities including informal interactions with the experts of astronomy, visits to the places related to the subject such as planetarium & ancient observatories like Jantar Mantar and the Non Conventional Energy Resources Centre etc. besides, children also get an opportunity to use solar energy themselves for cooking their own food. The programme ends with the Post-Test. The results of these Pre-Test and Post-Tests help in improving the programme and activities of museum further. Traditional Paintings like Varli, Madhubani etc. To motivate them to preserve and conserve their heritage and join hands in continuing some of the dying arts & crafts of the country. In commemoration of “World Heritage Day” National Children’s Museum organizes ‘Heritage Week’ every year in the month of April with an objective to make the children realize that the cultural heritage belongs to them and it is their prime duty to preserve and conserve these monuments which are the symbol of the glorious past of our country. During this week long programme through interaction, slide shows, quiz programmes, guided visit to some important monuments enrolled in the list of World Cultural Heritage. Besides, painting and clay modeling activities are also organized wherein children either draw the monuments or make its model in clay/white clay etc. While doing this they efforts are made to meet with the above objectives observe, learn as well as understand unknowingly the salient features of the art & architecture of a particular period. To relate day-to-day life experience with various concepts they study in their books. The Museum also undertakes various excursion programmes where prominent historical places excavation sites and other materials related to our past and present are shown to children so that they get practical knowledge of subjects related to their curriculum. 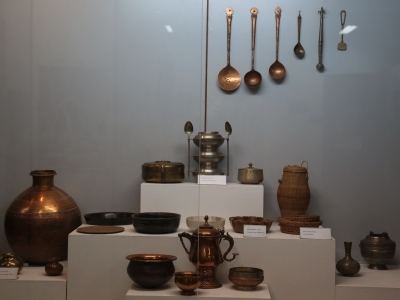 During Summer Session in the months of May/June when, Master Craftsmen are invited to the National Bal Bhavan to display their products and impart training to the children in their specilized arts and crafts, the Museum gallery hums with activity, becoming the most vibrant of all-a places where the children’s creative endeavours are at their best. National Bal Bhavan is also concerned about those arts which are on the verge of extinction. Therefore, conscious efforts are made to transfer these art and crafts to the next generation. Non-Formal Education Workshop for children belonging to the lower most strata of society is also conducted to motivate them to ‘Learn and Earn’.